Belfast City Council (Irish: Comhairle Cathrach Bhéal Feirste; Ulster-Scots: Bilfawst Citie Cooncil) is the local authority with responsibility for part of the city of Belfast, the capital and largest city of Northern Ireland. The Council serves an estimated population of 333,871 (2011), the largest of any district council in Northern Ireland, while also being the fourth smallest by area. Belfast City Council is the primary council of the Belfast Metropolitan Area, a grouping of six district councils with commuter towns and overspill from Belfast, containing a total population of 579,276. The Council is made up of 60 councillors, elected from nine district electoral areas across the city, most representing the more heavily populated north and west. It holds its meetings in the historic Belfast City Hall. The current Lord Mayor is Brian Kingston of the Democratic Unionist Party. As part of the 2014/2015 reform of local government the city council area expanded and now covers an area that includes 53,000 additional residents in 21,000 households. The number of councillors increased from 51 to 60. Elections to the expanded city council took place on 22 May 2014. Belfast's modern history can be dated back to the Plantation of Ulster in the early 17th century which brought significant numbers of Protestant Scottish and English settlers to Ulster. The town gradually developed to become a major industrial centre, in particular in the areas of linen and ship building. In recognition of this growth Belfast was granted city status in 1888 and by 1901, it was the largest city in Ireland. The city's importance was evidenced by the construction of the lavish City Hall, completed in 1906. The body now known as Belfast City Council has its origins in the defunct Belfast Corporation, and was created on its current boundaries following the local council elections of May 1973. Originally it was intended that there would be 52 wards. However, local enquiries meant that the proposed Tullycarnet ward became instead the Castlereagh Borough Council wards of Tullycarnet and Gilnahirk, leaving Belfast with 51. Although the county borough of Belfast was created when it was granted city status by Queen Victoria in 1888, the city continues to be viewed as straddling County Antrim and County Down with the River Lagan generally being seen as the line of demarcation. From the late 18th century onwards, the city's Roman Catholic population gradually increased, although the city was still dominated by its mostly Ulster Protestant majority. The council was dominated by unionists from its inception until 1997, when they lost overall control for the first time in its history, with the Alliance Party of Northern Ireland gaining the balance of power between Irish nationalists and unionists. This position was confirmed in the three subsequent council elections, with mayors from the Irish nationalist Sinn Féin and Social Democratic and Labour Party (SDLP), and the cross-community Alliance Party regularly elected since 1997. The election in 2011 saw Irish nationalist councillors outnumber unionist councillors for the first time, 24–21, with Sinn Féin becoming the largest party, and the Alliance Party maintaining the balance of power with six members. The 2011 census findings confirmed this significant change in demographics. In the Belfast City Council area, the proportion of people who were Catholic or brought up Catholic (48.58%) is larger than those who were Protestant or brought up Protestant (42.30%) for the first time. In terms of national identity 43.16% of the population considered themselves to be British, 34.77% considered themselves to be Irish, and 26.82% considered themselves to be of Northern Irish nationality. The coat of arms of the city (pictured, above right) are blazoned as Party per fesse argent and azure, in chief a pile vair and on a canton gules a bell argent, in base a ship with sails set argent on waves of the sea proper. This heraldic language describes a shield that is divided in two horizontally (party per fesse). The top (chief) of the shield is silver (argent), and has a point-down triangle (a pile) with a repeating blue-and-white pattern that represents fur (vair). There is also a red square in the top corner (a canton gules) on which there is a silver bell. It is likely that the bell is an example here of "canting" (or punning) heraldry, representing the first syllable of Belfast. In the lower part of the shield (in base) there is a silver sailing ship shown sailing on waves coloured in the actual colours of the sea (proper). The supporter on the "dexter" side (that is, the viewer's left) is a chained wolf, while on the "sinister" side the supporter is a sea-horse. The crest above the shield is also a sea-horse. These arms date back to 1613, when King James I granted Belfast town status. The seal was used by Belfast merchants throughout the 17th century on their signs and trade-coins. A large stained glass window in the City Hall displays the arms, where an explanation suggests that the seahorse and the ship refer to Belfast's significant maritime history. The wolf may be a tribute to the city's founder, Sir Arthur Chichester, and refer to his own coat of arms. The district councils of Northern Ireland were reformed in 2015. The councillors elected on 5 May 2011 served on Belfast City Council until 31 March 2015. At the local elections on 22 May 2014 a new Belfast City Council was elected and acted as a shadow authority until coming into its powers on 1 April 2015. The local government district of Belfast was expanded on 1 April 2015 to the south to include areas formerly part of the Castlereagh, Lisburn and North Down districts. The new electoral areas will be Balmoral, Black Mountain, Botanic, Castle, Collin, Court, Lisnasharragh, Oldpark, Ormiston and Titanic. 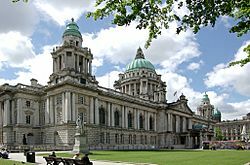 Minutes of meetings of Council committees and subcommittees are available at Belfast City Council (searchable) and at Belfast NI Gov Wiki (unofficial site). The area covered by the current Belfast City Council has a population of 333,871 residents according to the 2011 Northern Ireland census. The area covered by the old Belfast City Council before the 2015 local government reorganisation in Northern Ireland had a population of 280,962 residents according to the same census. In the 2011 census the distributions of population, religion, national identity and proportion of immigrants within the Belfast City Council area were as follows. Belfast City Council Facts for Kids. Kiddle Encyclopedia.